My fiber arts guild, the Riverbend Fiber Arts Guild, will have a tent at the Ketner's Mill Country Fair this weekend, October 15-16. Guild members will be doing demonstrations on spinning, carding and weaving and I'll be working with my hairpin lace loom. Come out to the fair and visit us at our tent, located next to the old mill building. Hairpin lace became popular in the Victorian era. It requires a few simple tools—a hairpin lace "loom," a crochet hook and some yarn or thread. The process of making hairpin lace is rhythmic, easy to learn and master and can be soothing and therapeutic. 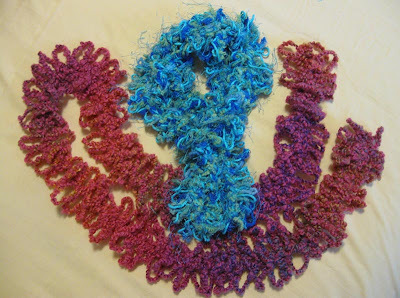 Children and adults can do it and you can have a fun and fashionable scarf (see photo) in less than an hour. A hairpin lace loom and lace items made with multiple strands of yarn. 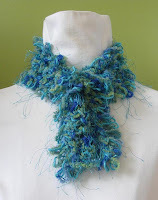 You can use one or combine multiple strands of yarn for your project. Have fun with some of the great novelty yarns on the market today—fur, eyelash, glitter, boucle, nubby, etc. 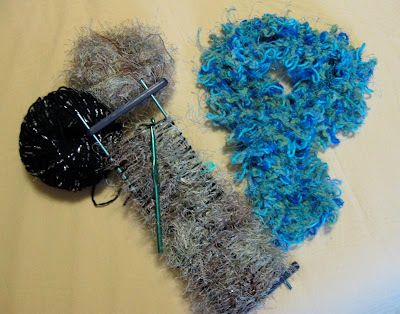 The photo above shows the loom with a piece made from a fun fur and a yarn with metallic highlights. Below is what the lace looks like when it come off the loom. Visit the Riverbend Fiber Arts Guild tent at the Ketner's Mill Fair this weekend. Guild members will have hand crafted fiber art pieces, hand spun yarns, fibers and hairpin lace kits available for purchase. Pick up some great items for holiday gifts or for yourself. Learn hairpin lace making—a classic technique with a modern twist. Once upon a time I used a hairpin lace loom to make doll hair. It turned out pretty good. Love everything you do!